By and large the various British steamship company's officer's uniforms of the Edwardian era mimicked those of the British Royal Navy of the same time period. 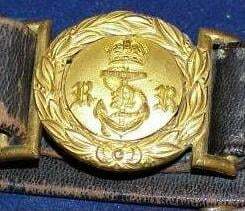 The only real differences were the buttons used, the cap badges, and, sometimes, the cuff braid that denoted rank. The White star Line was no exception. Only their buttons and cap badges were different, and both of those were even based off of the British Royal Navy's own buttons and badges. The difference in buttons was merely that the house flag had replaced the "fouled anchor" of the British Royal Navy, and the only variation in the cap badges was the same. Part of the reason for this was because many of the officers were reserve naval officers. Interestingly, the British Royal Navy reserve cuff braid differed greatly from both the White Star Line's and British Royal Navy's active duty uniform cuff braid. The Reserve was called the "Wavy Navy" as their braid was "waved" instead of straight, and instead of having a circular loop on the top row of braid, there was a six-point, rounded edged "star" design. This pattern was repeated on the shoulder boards, or "epaulettes". The "standard" uniform of the time was called "Service Dress", consisting of the appropriate visor cap, jacket, black pants, white shirt, black necktie, and black shoes. there was however, several other types of uniform, just as there was in the Navy. Service dress: The jacket for service dress was a double breasted eight-buttoned affair sometimes referred to as a "monkey jacket". Pants, shirt, etc., were all standard. The jacket and pants were almost always of black wool. Tropical or "Summer" Dress: For tropical dress, both the jacket and pants were white, and often, the shoes as well. The jacket was high "Russian" collared, and was single breasted, with only 5 buttons. Shoulder boards were worn with this instead of cuff braid on the sleeves. No tie was worn with summer dress, and the only shirt would have been a sleeveless undershirt. Mess Dress: "Mess Dress", as it is called, was for formal occaisions. In Cameron's movie, Captain Smith can be seen wearing this uniform while attending dinner in the First Class dinner area. It was, essentially, an Edwardian era tuxedo, with rank braid on the cuffs. Usually, any medals the wearer had earned would be worn in their "minature" (half-sized) format, for convenience. The jacket went over a vest, which went over a tuxedo shirt and bow-tie. the tie, depending on the occasion, could be either black or white. The jacket, pants, and vest were often of Melton wool, and usually of the "doe-skin" quality. There was also a "tropical" or "summer" pattern used sometimes. Essentially the same uniform, it was white, and of much lighter fabric. Court Dress: Based somewhat off the old British Royal Navy Napoleonic era uniforms, it was similar to "mess dress" except that it was longer in front, had two more buttons, tails in the back, and often more ornamental braid and buttons on the cuffs. The shoulder boards for court dress were of the heavy gold bullion variety, with braid tasels hanging down about the outside of the shoulders. Also, an old style "bicorn" hat was worn with this uniform. As the name implies, it was only for VERY formal occasions. A dress belt with gilded buckle and a sword were worn with this uniform. On Rank Insignia: Both cuff braid and shoulder boards used standard British Royal Navy gold bullion braid stripes to denote rank. Three straight stripes, with a fourth "looped" top stripe denoted the rank of Captain in the White Star Line. Two rows with a third looped top row denoted a Chief Officer, or the Captain of a smaller vessel. One row with a second looped row denoted a First Officer. Second Officer and lower were denoted by a single row of looped braid. Of note, in the British Navy, and in the Merchant Navy as well, after the loss of the "Titanic", all Engineering officers were authorized to wear a row of purple cloth (A sort of broad "piping" ) between the rows of braid on their cuffs or shoulderboards to denote their service in the "Engineering Branch". I have heard that this was authorized to commemorate the loss of all of "Titanic's" engineering officer's, who gave their lives in order to give the ship and its passengers as much time as possible. Many thanks for the help, Frank and Parks. I look forward to seeing your replica cap badges. Btw, this is a great website! Speaking of the uniforms, who was the manufacturer of said uniforms for White Star? I would imagine that there was some individual tailoring involved for each officer (I could be wrong, of course). In that case, is there any particular establishment in Southampton (I wanted to say Soton, sorry) that would have done this? Okay, Parks was kind enough to answer my question via PM, and gave me permission to post the answer for the edification of others: "To answer your question on the list about uniforms...no single manufacturer of WSL uniforms. Individual tailors put together the uniforms from a standard pattern (which was the Royal Navy pattern). A popular tailor for WSL officers sailing out of Soton was Miller & Sons." Yep, Pat. Doeskin was a fine, light, very high quality wool. Frock coats and formal overcoats for the Royal (and Imperial) Navy were made from it, in other words, the more formal garb naturally demanding better cloth. Ordinary service dress like reefer coats and bridge jackets were usually something like pilot cloth or other coarser wools. 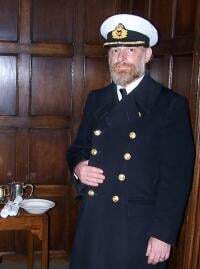 Some of the Titanic movies depict the quartermaster at the wheel in "Dress Blues"...the kind with white stripes, etc.,that is; similar to those in the Naval Services. Would this be correct attire ? In others some of the crew are shown with dark jerseys with White Star lettering in white ? Would they have worn the "Dress Blues" for special occasions such as leaving port and the less formal while underway ? Kirstin, try page 142 of . The class is not given, but I fancy uniforms were much the same in all classes. Contemporary photographs often show Edwardian seamen wearing what used to be called "monkey jackets" - short navy-blue coats. These appear to have been the preferred type of jacket for a wide range of seafarers, including stewards and stokers. Whether these jackets could be described as "uniform" is, however, another matter. Showing 20 posts of 50 total. View all.